Morsels of bread, crumbly, light, with surface sesame seeds. Color: gold yellow with the typical bleaching of bread crust, sometimes slightly tanned. Flavor: of bread, light and pleasant, with pleasantly influenced by Italian extra virgin olive taste. No additives (preservatives, emulsified, ecc.) 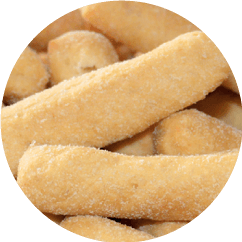 – long yeast – slow cooking of different temperature and use of iodized salt “PRESAL®”. The dough, made with flours rich in gluten and precious extra virgin olive oil 100 % italian, without addition of a preservative alcohol, are some basic parameters of main ingredients; it’s left to stand for more of twenty-four hours: a very slow leavening to “long yeast”. 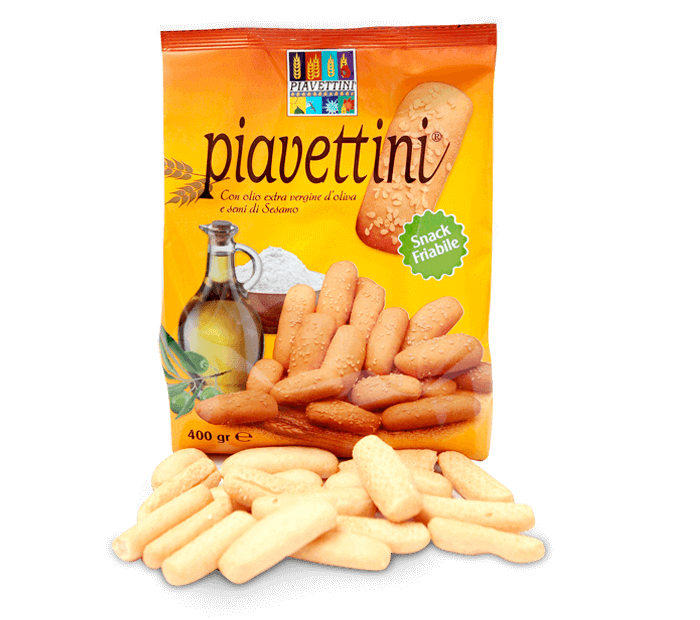 For this particular work and careful research on flavors, Piavettini are morsels of bread unmistakable. The non-perishability and long preservation, in excellent integrity conditions, are favored, as well as the measures relating to packaging, the low humidity of the product (UR max 3 %). Pairings: Pleasantly accompany any dish. Marry the sweetness of ham or typical fresh cheese. Also excellent with cheeses and cured meats, placed together with a good glass of wine. Try them with a chip of Parmigiano Reggiano or Grana Padano. Soft wheat flour type “0″ – extra virgin olive oil (10,2%) – lard – “presal®” iodized salt – malt extract – yeast cream – dusting the surface with sesame seeds (0,2%).